Welcome to our second newsletter of 2019, we hope you enjoy reading about our various activities. If you want to get in touch with us about any of the items mentioned in this newsletter, or if you have suggestions you would like to make, our contact details are at the bottom of the page. David Anderson, our Development Officer has now been with us a year. How time flies when you’re enjoying yourself! We are very grateful to him for his new ideas and the opportunity to reach out to more people. 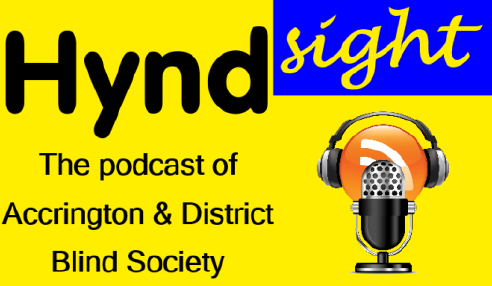 If you want to listen to his review of the past year, you can do so by listening to our new podcast, called HYNDSight. If you don’t have access to the Internet, or would prefer to talk to David, he would welcome any ideas you may have about how we could improve our service or any new things we could try. He can be contacted via our office number 01254 233332 or his mobile 07496 859673. There will be more editions of the podcast in the coming weeks and months. Over the coming months David, is planning to speak to various local organisations and, using a new simulation app called Eyeware, develop their awareness of what it is like to be visually impaired. If you have any contacts within organisations that may be interested, please encourage them to get in touch with us. Due to popular demand, this group now meets every Tuesday morning at our Bank Street premises from10:30am to 12:30 pm. Some of the meetings are informal coffee and chat, but for others, particularly the second Tuesday of each month there is usually a guest speaker or a demonstration of equipment helpful to those with sight difficulties. On 9th April we had a visit from Jodie (Ophthalmic Director) and Laura (Lead Optician) at Specsavers who very helpfully answered questions about vision and sight tests. On 14th May we will be visited by one of the town centre PCSOs, who will give some helpful advice about personal and home security. Also, on 11th June we will have a visit from Marcia Collins who is a local representative for DeafBlind UK. This charity helps those who have both vision and hearing difficulties. If you are interested in receiving advice from her for yourself or a friend or are interested in how to communicate with those who have sight and hearing difficulties, please come along. If you would like to meet up informally with other people who are experiencing sight problems, you are very welcome to come along to any of these meetings. Pauline and her team are always happy to help you in our Sight Advice Centre in Bank Street. We have various items of equipment to help with daily living, leaflets about different aspects of eye health, and lots of other useful information. If we don’t know the answer to your question or don’t have the equipment you want, we will do our best to find it. If you wish to purchase anything, we currently can only accept cash or cheque, but we hope soon to be able to accept payment cards. You are warmly invited to pop in any Tuesday or Thursday, or first Saturday morning of the month to have a chat, a cuppa and have a look at the literature and equipment available for yourself or others. Many people have benefited from the Living With Sight Loss courses we have run in partnership with the RNIB. The RNIB have had some changes in staff recently and we are discussing with their new Confidence Building Co-ordinator Kalsum Akhtar the best way of delivering these courses in the future. We are hoping to run a course in the next few months. If you are struggling with your vision and would like to find out more about what help is available locally and nationally, please contact us and we will let you know the details of the next course when it has been arranged. This group runs on the first Saturday of each month to encourage people with a visual impairment to start or continue with photography as a hobby. This has been supported by a grant from East Lancs. CCG. We have just finished our third 6 week series of ‘Can’t See Can Cook’ cookery sessions with tutor Bill Wynn from Lancashire Adult Learning, These have been very enjoyable and well received. We are hoping to run more cookery sessions in the autumn. Places are limited, so if you are interested please contact us on 01254 233332 for further information or to book a place. Several “working age” people have shown interest in meeting and taking part in social activities together. They have started by having lunch together on Saturday 2nd February and Saturday 6th April and the number of people involved is growing. They will getting together again on the first Saturday in June, so if you are interested in getting involved, please contact us and we will put you in touch. Organised in partnership with Enhanced Vision, this day will give you the opportunity to see some of the latest equipment to help you to see and read more easily and live more independently. There will also be the opportunity to chat with Michelle from the Macular Society, who will be there to give you advice on how to cope with macular problems or support a relative or friend who has macular disease. OrCam MyEye 2.0 is an intuitive wearable device with a lightweight smart camera, designed to assist people who are blind or partially sighted. • It also reads and identifies barcodes. You are invited to come and try OrCam MyEye for yourself at our Bank Street Sight Advice Centre on Thursday 25th April between 10:30am and 2:30pm. Just pop in when it is convenient for you. Our Making IT Work tech. drop-in sessions can provide free and impartial advice on what technology can give greatest benefit to you. Do you want to use your tablet, computer or smart phone to make life better for you? Do you want to know how Siri, Alexa or Google Home can be your own personal home assistant? One to One technology sessions with Claire from the RNIB will continue to be held on the third Tuesday of each month at our Sight Advice Centre on Bank Street. Ring us for further details or to book a one hour session with her. Braille-IT continues their classes at our Bank Street premises on Tuesday mornings and alternate Saturdays You would be very welcome. These are continuing on alternate Thursday mornings. The cost is £5 for a one hour session. It would be helpful if people who would like to attend could let Pauline or Chris know by phoning us on 01254 233332. If you need something new to read, pop into our bookshop in the Arndale Arcade. The shop has a wide selection of printed books and also some audio books on CD. Good quality books are always welcome, so if you or your friends have any to spare please let us know. We are really grateful to our volunteers who give so much of their time to welcome visitors to the shop. The bookshop has now extended its opening hours to include Wednesday mornings. On Tuesday 12th March we were very pleased to welcome the Mayor of Hyndburn as he visited our Sight Support Centre. As we were one of the chosen charities for support during his term of office he was very interested to see the activities taking place and talk to the people involved. We are very grateful to him for this support and encouragement. The 12th March was also the day we discovered that we had had a break-in at our Sight Advice Centre. A window, door and partition wall were damaged and a number of items such as smartphones and iPads were stolen. We had been using these to help visually impaired people learn to use their accessibility features to access the Internet and communicate with friends. We are very grateful to the Trustees and volunteers who helped us to continue with our events that day and to those who have donated money and items to help us continue this service. If you have an electronic tablet or smartphone you no longer use please consider donating it to our group, as technology can make a big difference to people’s lives. We are looking for a volunteer driver to help David and others visit various events in the local community to talk about our activities, display information and demonstrate equipment. We are also looking for a Handyperson to do small maintenance jobs at our Bank street premises and liaise with visiting contractors. Please tell your friends about Accrington & District Blind Society and, if possible, arrange or take part in an event to support our work. You could make a big difference and help ensure the future of our charity and the development of services across the community to ensure people with a sight loss lead full and independent lives. Our long term future depends on increasing our income through having a higher profile in the community and attracting legacies and donations. If you would prefer to receive this newsletter in larger print, in Braille, or by email or audio recording, please let us know. Please remember that the office is presently open Tuesdays and Thursdays10am to 4pm and the first Saturday morning of each month 10:00am to 1:00pm.